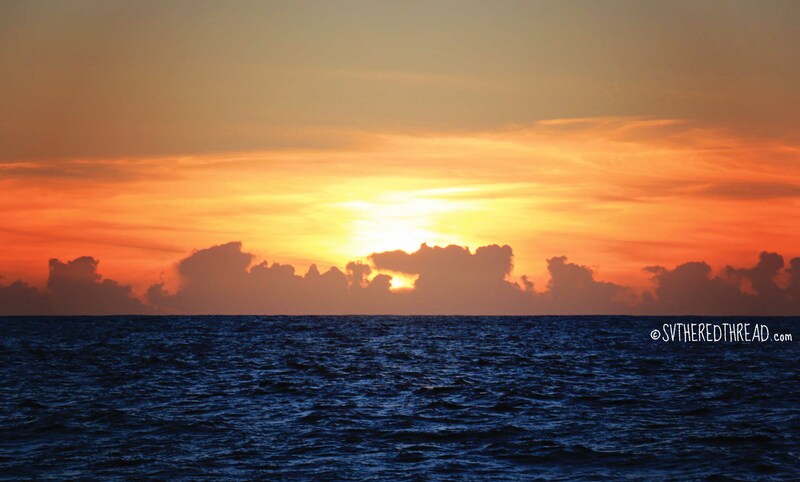 We are in the center of the fleet as the sun melts into the horizon. The sails of our good friends on s/v Namaste look like wings under a pink sky with an early-rising moon. Ahead of us are s/v Sea Rover II and s/v Kialoa, two Canadian couples whom we met just a few days ago. Behind us, s/v Astraea with whom we connected initially via our blog, carrying her family of three. The youngest crew member among us, two-year-old Sully, likely napping his way across the border. 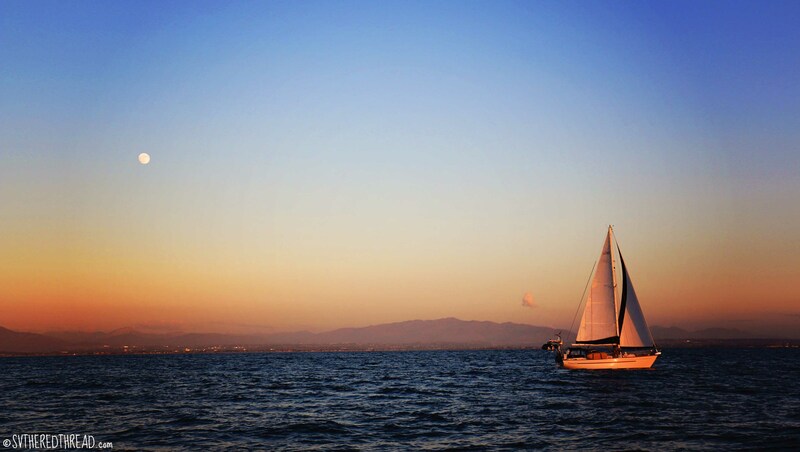 Our fleet of five look beautiful sailing together into the sunset, all eager to begin our adventures in Mexico. 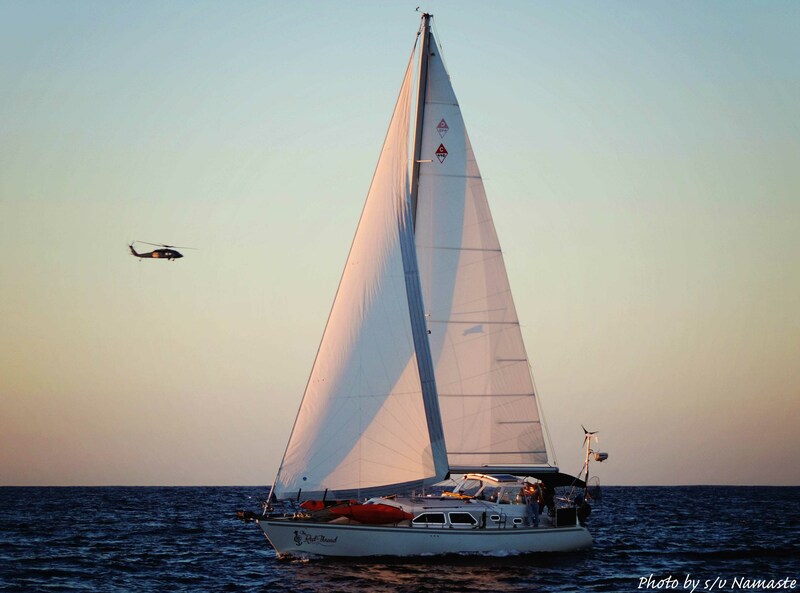 Each of our boats is on a different path, with unique aspirations and plans and final destinations, but on that night, we were an impromptu flotilla of sorts sharing a passage from San Diego to a new nation. We found solidarity in bihourly check-ins on our VHF radio to discuss winds and seas and to share our thoughts on sleepiness and standing watch. At our midnight check-in, the call-in cast was all female. I experienced a sense of pride in being in the company of strong adventurous women; the type of woman I strive to be. It all sounds a bit starry-eyed, I suppose, and for that I blame the enormous and spectacular full moon that glittered on the water. Idyllic it most certainly was, even if the winds were inadequate, requiring us to motor much of the night. Arriving in Ensenada, I feel triumphant. The feeling comes at the end of a short passage, just 65 miles, but crossing into Mexican waters symbolizes something greater. Pinch me, Neil and I are really doing this! A farm girl from rural Utah who had never set foot on a sailboat until three years ago has, in 65 days, sailed the entire west coast of the contiguous United States. Literally. Top to bottom. The beauty of never knowing what life has in store, good or bad, feels in this moment like a weight I could not be more delighted to carry. I went on deck and hoisted our Q-flag in the dewy dawn. Grinning, I danced my way back to my handsome husband who stood tired and strong at our helm. My eyes felt heavy, but my heart felt full. Single-night passages seem more trying than those that last multiple days. It’s almost impossible to establish immediately and effectively the sleep schedule necessary for night watches. For instance, on this passage, I took the first watch (8 pm – midnight), but Neil had a difficult time getting much sleep during those hours, a phenomena I experienced during our passage from Monterey to Santa Barbara. He took the later shift (midnight to 4 am), but since we were to arrive by 7 or 8 am, going back to sleep felt futile, so he opted to take an extended watch. The combination of factors meant that post-passage passing out was inescapable. I cooked pancake, eggs, and sausage for breakfast. After he swallowed his last bite, Neil tipped over on the seat right there at the table and was out like a light! I left Neil to snooze as long as I dared and roused him so that we could climb off the boat to find Centro Integrales de Servicios and to begin the paperwork cha-cha-cha, the process required to officially check into Mexico. The procedure to check in varies somewhat from nation-to-nation. Traveling from the US to Canada, which we’ve done several times, is a cakewalk. Step 1: sail to Victoria, BC; step 2: stop at Canadian Customs dock; step 3: pick up phone on Customs dock and answer simple questions asked by kind agent on the other end of the line; step 4: there is no step 4…it’s that simple. And free. Checking into Mexico is more complex and costs about $250 USD in total. Thankfully all of the key stakeholders in the check in process (i.e., Inmigracíon, Bank, Capitanía de Puerto, Customs) are housed in one building! Our understanding is that we will not always experience such centralization in other nations. Step 1: Go to Inmigracíon, present your passport, and complete the paperwork for a tourist card for each crew member. Step 2: Go to the Bank to pay for tourist card (meaning turn around, walk diagonally across the room to a different office, and wait in a different line). Step 3: Return to Inmigracíon to provide proof you paid the Bank for your tourist card (to the back of the line again, por favor). Step 4: Go to Capitanía de Puerto (i.e., Harbormaster; in the other corner of the building with its own waiting line) to demonstrate proof that you do indeed own your boat. Step 5: Go back to the Bank (yup, back of the line again) with papers stamped by the Capitanía de Puerto, present proof your vessel is insured, provide serial numbers for all engines associated with your vessel, and pay for a 10-year Temporary Import Permit for your boat. Step 6: Visit Customs and experience subsequent sense of relief that the extent of your vessel’s liquor booty was not queried. Step 7: Be glad you purchased a Mexican fishing license before leaving the USA so that you don’t have to visit yet another office with yet another line. 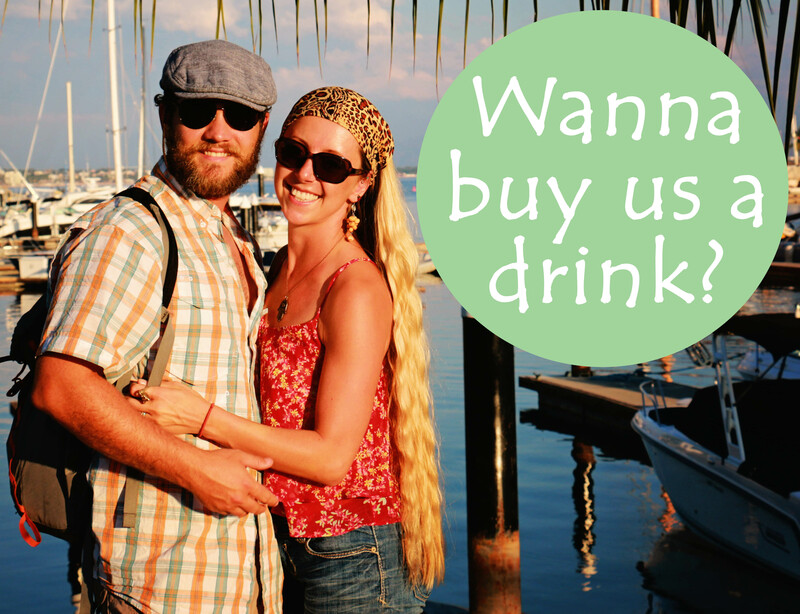 Step 8: Return to sailboat and share celebratory drink (in our case a bon voyage beer from Cap’n Ron!) while hoisting Mexican courtesy flag!! Bienvenido a México! 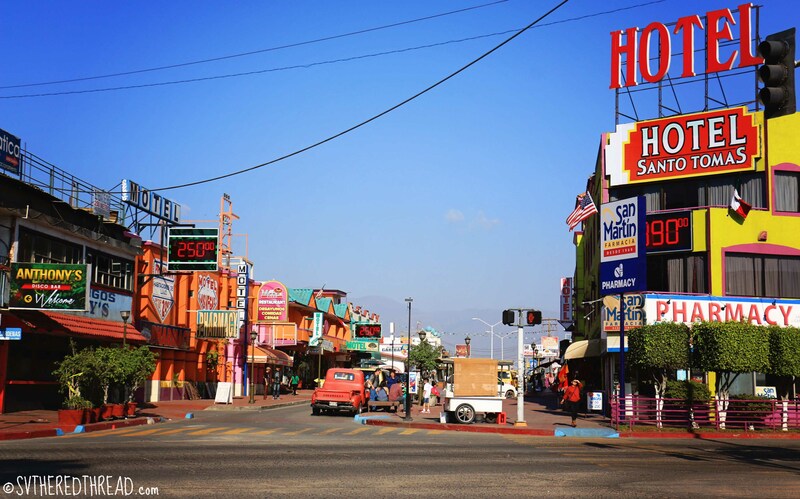 The whole process of checking into Mexico took less than 90 minutes; speedier than described in our guidebooks. We remained docked at Baja Naval Marina for the next two days, exploring the streets of Ensenada and gearing up to traverse the most remote stretch of the Pacific coast of Baja California. 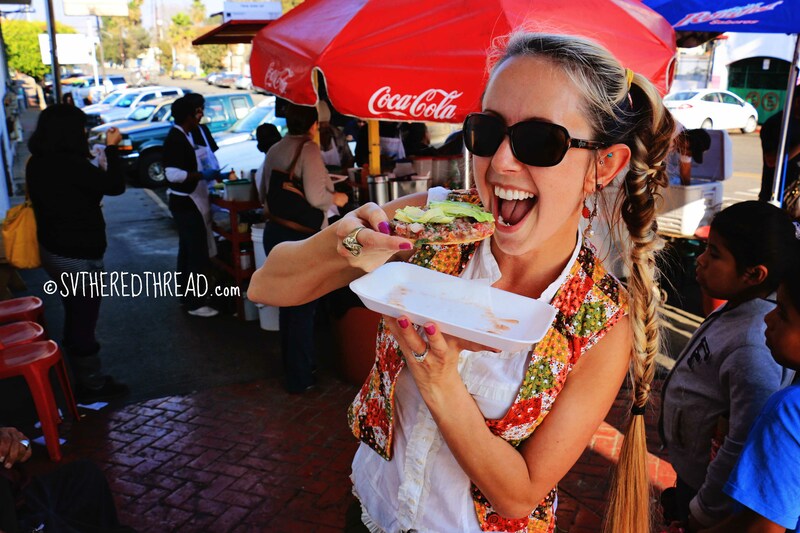 We sampled tostados pescado y camarón (fish and shrimp) from a food cart and turned up our noses in the touristy bar district, as the stench of vomit hung in the air from partiers the night prior. Ironically, one of the highlights of our stay was the mile-long field trip we took with several other cruisers to fill our 5-gallon jerry jugs with diesel. There is nothing like being in a crowd to make the load of a laborious task lighter and more humorous! 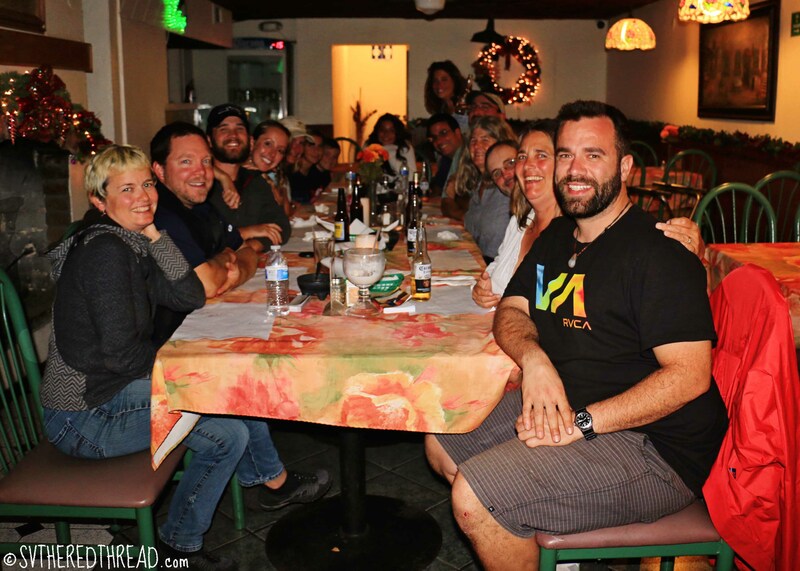 We spent our last night sharing dinner, stories, and laughter with our new friends. Upon our departure from Ensenada, our cruising posse had multiplied, and we were teasingly referring to ourselves as The Umbrella Dumpers. All but one of us had set sail from the Pacific Northwest, and even the boat with the southernmost hailing port had once resided in Washington. We now consisted of 7 boats, 15 adults, 4 kids, 2 dogs and 1 cat. Jessie’s musings: Two moments stand out as being particularly salient for me. First, the way I felt staring out at the other boats, our friends, as we departed San Diego. I felt excited yet content and was filled with a sense of enthusiasm for our journey; for life, really. The second moment was the sheer exuberance I felt as I tied bowline knots to connect our Q-flag to our boat. The line felt cold and damp, and I had to tug extra hard to hoist it. Seeing our yellow flag fly, a symbol informing Mexico of our wellbeing and intent to clear into their nation, was surreal in the best of ways. Neil’s reflections: The passage was uneventful, with mild seas. It was a super calm night, and the moon was out. It was truly incredible to make the passage with other boats and to see the rosy glow over the port as we entered Ensenada. 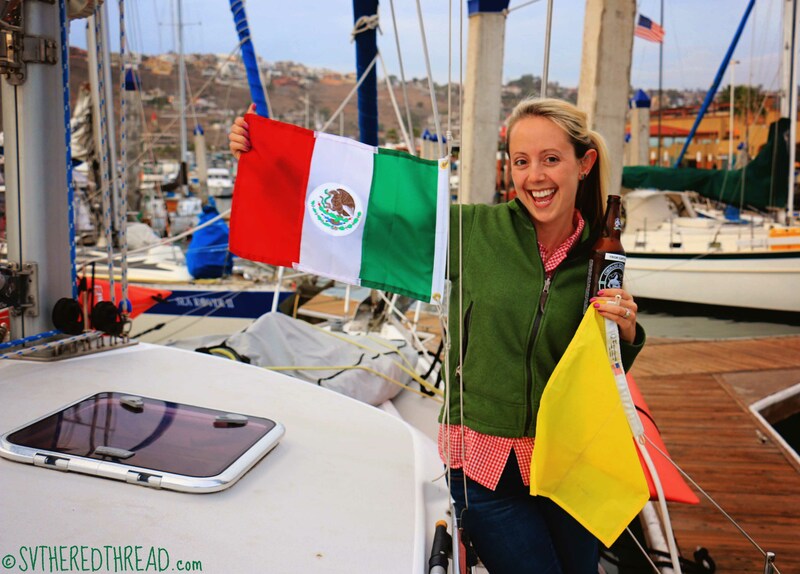 This entry was posted in By Jessie, Friends and loved ones, Mexico, Passages, Sailing, South Pacific Stitch and tagged Baja Naval, Ensenada MX, Umbrella Dumpers. Bookmark the permalink. So glad we got to know you two at Chatterbox Falls. We feel like we are on the voyage with you as you keep us up to date so explicitly. We are clearing out of Gig Harbor in six days for three months of snowbirding in Phoenix. Take care. We wish you a very merry Christmas wherever you may be. What a great feeling to accomplish a long sought after goal! Your excellent storytelling is helping me picture the same scene for s/v Blue and crew! Thanks for being so positive (yet real) and inspiring!